The Highlands of Scotland contain some of the most spectacular scenery in the world. A timeless wonderland, where roads and railways cut through breath-taking mountain landscapes, past deep and mysterious lochs, through the world's finest whisky-producing regions, and up to the highest peaks in Britain. The Highlands are suffused with the romance and grit of the clans, and nowhere in the country is it clearer that the Scottish have a proud, ancient culture, independent of the rest of the United Kingdom. The city of Inverness is the gateway to the Scottish Highlands. It is a very attractive place, built alongside the River Ness, which has a rich history palpable in its ruins, museums and the important battle sites just outside the city. It is the northernmost city in the UK and a delightful travel base for visitors hoping to explore the north of Scotland. The deep and dramatic Loch Ness, a short journey from Inverness, is the legendary home of the mythical Loch Ness Monster and attracts thousands of visitors every year, all eager to catch a glimpse of 'Nessie' or just enjoy the stunning scenery around the loch. Off the coast, the Hebrides, Orkney and Shetland Islands with their rugged and dramatic scenery, reveal ancient settlements and unspoilt insights into the ancient history of Scotland. A visit to this highland wilderness, despite predictably unpredictable weather, ignites a very basic pleasure and can be a glorious and refreshing experience. 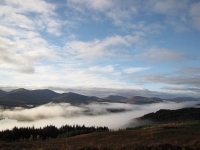 The Highlands are a haven for hikers, with some superb, remote walking trails.